In a nutshell, we all know that Bitcoin is A Peer-to-Peer Electronic Cash System, but what is the actual Bitcoin White Paper that we all have heard of? An authoritative report or guide that informs readers concisely about a complex issue and presents the issuing body’s pilosophy on the matter. It is meant to help readers understand an issue, solve a problem, or make a decision. To be completely honest, Bitcoin white paper is something that is rather difficult to grasp even for those with a programming background. Let alone for those without any knowledge of programming or cryptography whatsoever. However, the whole idea of the article is to make technical terms easy to understand so don’t let your head down! Bitcoin has shocked the world and is on the verge of broader adoption, but most of us are still unable to explain what Bitcoin really is. It is mostly known as the “internet money” – and it is true. However, before labeling the extremely disruptive technology as “internet money”, we should understand what stands behind those two words. I strongly recommend you to read the actual Bitcoin white paper here. Even though its only 9 pages long expect to read something rather technical. I won’t be covering each part of the white paper and reading it prior just gives you an idea where we are and what topics are being explained. Without further ado, Bitcoin White Paper Explained Simply. What is Bitcoin and what is Bitcoin White Paper? A purely peer-to-peer internet currency that allows online payments to be sent directly from one party to another without going through a financial institution. Straight from the abstract, Bitcoin is a substitute for traditional money (US dollars and other currencies) that can be sent from person A to person B without a bank or government mediating the transaction. If you have read about Bitcoin or cryptocurrencies before, you have probably heard the words centralized (fiat currencies) and decentralized (Bitcoin). The proposal of decentralized currency comes from Bitcoin white paper. Our current methods of making a transaction require our money to go through different intermediaries. In example: If John sends money to his daughter Jane in Paris, the money has to go through John’s local bank > Federal Reserve > European Central Bank before finally appearing on Jane’s local bank account in Paris. Bitcoin escapes that practice by allowing funds to go straight from one place to another (person to person) without it traveling through a third party and that is exactly why Bitcoin is decentralized. There are no intermediaries between you and the other person. How Bitcoin does it, how can two strangers trust each other? We are now approaching to a bit more technical part, but I will keep this as simple as possible. Simply said, Bitcoin (and other cryptocurrencies) is defined as a chain of digital signatures. Have you signed anything online? Just like each person has their own unique physical signature, everyone that can hold Bitcoin has a digital signature that is unique to them. In the same way, you may sign a piece of paper to confirm that it’s yours or verify that you’ve read it, digital signing is having a computer do some mathematical equations to ensure that you authenticate a process, transaction, or data. Each owner transfers Bitcoin to the next by digitally signing a hash of the previous transaction and the public key of the next owner and adding these to the end of the blockchain. A payee can verify the signatures to verify the chain of ownership. The process on Figure 1 defines the transaction. 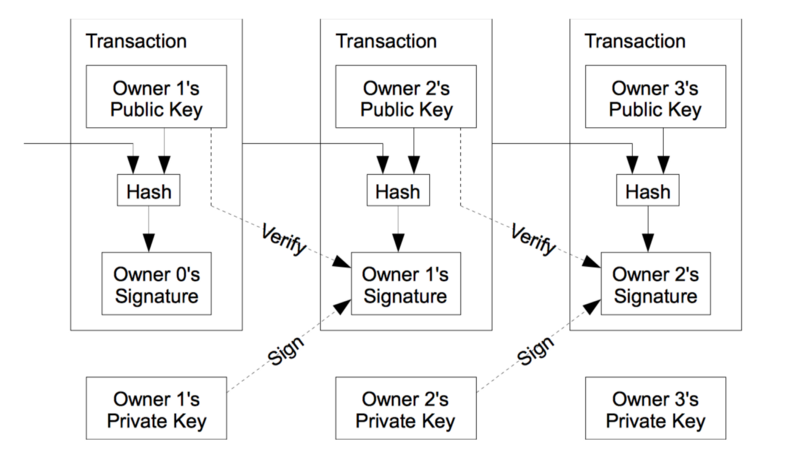 You must be wondering what is hash and what is a public key – let’s have a quick look. In the Bitcoin protocol, hash functions are used to write new transactions into the blockchain through the mining process. This lock has three states: A (locked), B (unlocked) and C (locked). And it has two separate (yes, two) keys. The first one can only turn clockwise (from A to B to C) and the second one can only turn counterclockwise (from C to B to A). Jane (the owner) picks the first one of the keys and keeps it to herself. We will call this key, her “private” key – because only Jane has it. We will call the second key, her “public” key: Jane makes a hundred copies of it, and she gives some to friends and family, she leaves a bunch on her desk at the office, she hangs a couple outside her door, etc. If someone asks her for a business card, she hands him a copy of the key too. Jane has her private key that can turn from A to B to C. And everyone else has her public key that can turn from C to B to A. – Panayotis Vryonis via Medium. A Bitcoin transaction is unique. As it happens between two parties on the different sides of the Earth, the transaction or exchange of the currency is never physical. We can’t rely on intermediaries as PayPal or banks to manage those transactions. Bitcoin approach is different, it’s doing it by solving complex mathematical equations. What makes the whole system secure and not compromisable? …we propose begins with a timestamp server. A timestamp server works by taking a hash of a block of items to be timestamped and widely publishing the hash, such as in a newspaper or Usenet post [2–5]. The timestamp proves that the data must have existed at the time, obviously, in order to get into the hash. Each timestamp includes the previous timestamp in its hash, forming a chain, with each additional timestamp reinforcing the ones before it. To make it easier to understand, the timestamp server is a piece of software that digitally time stamps data. The server groups processed transaction into a block and makes it publicly available for everyone to see. The existence of a given transaction in the blockchain is a proof that the transaction really exists and is valid. The blockchain keeps the transactions in chronological order which ensures the integrity of the chain. As time goes by the size of the blockchain get larger as the transaction history increases. This means the chain becomes more secure and resistant to compromise. 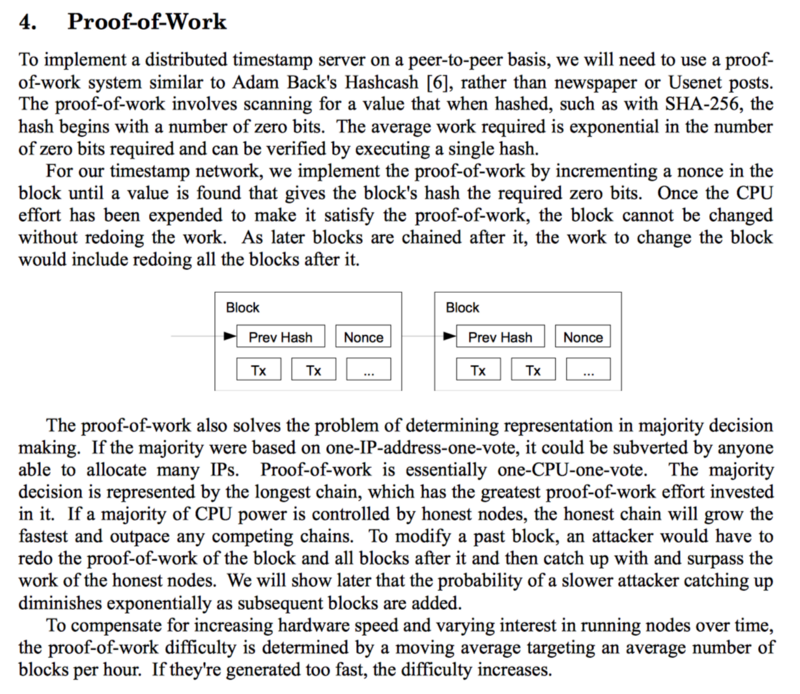 Proof-of-Work (POW) stops possible hackers overpowering the official chain with a fraudulent chain. Intermediaries exist to prevent theft and people rely on them as they do not trust an another person. Therefore they need someone they both can trust. Bitcoin in the other hand does this by establishing a POW system that makes sure that every block added to the blockchain is authentic. It does that by the majority decision and the majority is the longest chain of blocks (completed transactions). Longest chain of blocks will be the official/secure chain if the chain is controlled by honest nodes (computers). The honest chain is ensured by miners, computers solving mathematical equations to receive more Bitcoin for their effort. There is a bit more technical POW screenshot from the actual white paper. Where does the Bitcoin network run? As of now, the network mostly runs on high-performance computers that have enough power to manage all of the transactions. Those computers are needed due to the increasing mining difficulty. It was once economically viable to mine Bitcoins with your standard home-use laptop. Compared to today where Bitcoins are mined in massive mining farms in China. Why are miners mining if it costs time and money (electricity) to do that? By convention, the first transaction in a block is a special transaction that starts a new coin owned by the creator of the block. The incentive can also be funded with transaction fees. If the output value of a transaction is less than its input value, the difference is a transaction fee that is added to the incentive value of the block containing the transaction. As the white paper states, each time a miner creates a block it will be rewarded a new Bitcoin. This is the main reason why people are connecting their computers to the Bitcoin network. Additionally, every miner receives a proportional reward for processing the transactions. Additionally, every miner receives a proportional reward for processing the transactions. Once the maximum 21 Million Bitcoins have entered the system, the incentive to keep the nodes mining comes solely in the form of transaction fees, which are not subject to inflation. These incentives should keep the nodes honest and stop them turning to fraud to make a profit. Anonymous and private at the same time, how? All of the transactions are public (see live transactions here), however, the public keys cannot be associated with any individuals. The identities of the sender and receiver remain anonymous. We can easily declare those vast amounts of money exchanging hands, but we will never know the identities behind them. And there you have it, folks! Bitcoin white paper in a nutshell. If you have any questions, let us know and thanks for reading!